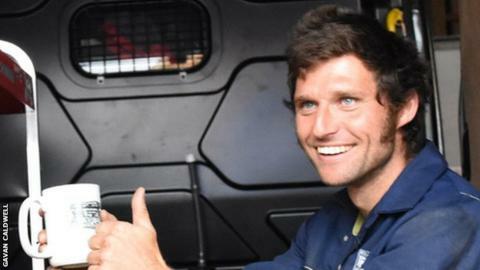 Guy Martin will return to the Cookstown 100 road races on 28 and 29 April on board a Honda Fireblade Superstock machine, the organising club have said. The 35-year-old has been a regular competitor at the event and has five victories over the Orritor circuit. The Lincolnshire rider missed last year's meeting as he opted to sit out the road racing season but is back in action in 2017 with Honda Racing. Martin will also race at the Tandragee road races on 21 and 22 April. He last competed in that event, run by the North Armagh club, in 2005, when he enjoyed a best finish of third. His return to the North West 200 and Isle of Man TT was revealed in January. Martin will take part in the Open and Cookstown 100 feature races on the all new SP2 Honda, having previously tasted success in the main race of the meeting as part of the Tyco BMW team in 2015. The television personality has also been linked with taking in the Tandragee 100, which opens the Irish road racing season on 21 and 22 April. The news of Martin's entry for the Cookstown will provide a major boost to the event, given the extra financial pressures that clubs are under because of escalating insurance costs.